TULARE - World Ag Expo and E.M. Tharp, Inc. have teamed up again to provide the “We Believe in Growing” scholarship, created to support agricultural education. High school seniors from Madera, Fresno, Tulare, Kings and Kern counties are encouraged to apply by Jan. 17, 2014 to be considered. Two $10,000 scholarships will be awarded to students who attend a four-year university to major in an agricultural field. The scholarships will be disbursed over four years at $2,500 per year. To be considered for the scholarship, students must submit two letters of recommendation; one copy of their high school transcripts; ACT or SAT scores and be graduating from high school during the 2013-2014 school year. 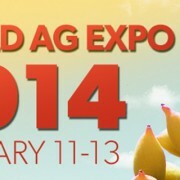 Download applications at: www.worldagexpo.com/-we-believe-in-growing-scholarship. Send completed applications to: International Agri-Center, “We Believe in Growing” Scholarship, 4500 South Laspina Street, Tulare, CA 93274.